If you like cookies and milk, then imagine a "cookie slice" with ice cream. 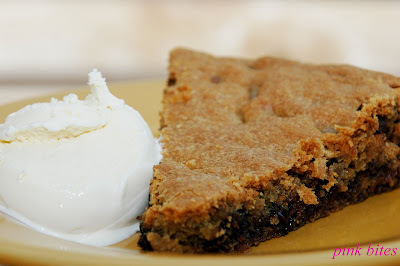 That is what you get from this recipe, a huge skillet-size cookie that is sliced and served warm with some vanilla ice cream. The recipe is as easy as a regular chocolate chip cookie, with the advantage that you don't need to make individual ones. Instead, the entire dough is spread onto a skillet. Transfer dough to a 10-inch ovenproof skillet, and press to flatten, covering bottom of pan. Bake until edges are brown and top is golden, 40 to 45 minutes. Don't over bake; it will continue to cook a few minutes out of the oven. Transfer to a wire rack to cool, 15 to 20 minutes. Slice and serve with ice cream. What an interesting way to make ccc's! I will have to try. oh. my. god. guess what my first recipe in my new kitchen is going to be?? this looks incredible! Katy - Good luck with your new kitchen!How exciting... Let me know how the cookie turned out when you make it. Great! Who doesn't love ccc? And bake it in a skillet is such a cool idea! I would have a big slice now! Hmm, I'm going to make some today! Do you mind if I post it on my blog and link back to your's? I wouldn't of thought of making them in a skillet! !